David Tattersall, Franic Rozycki and Jonny ‘Huddersfield’ Helm have been in a band together for a long time now, quietly crafting The Wave Pictures into one of the finest three-pieces in the country. Some things haven’t changed yet the band’s sound has certainly developed over the years. Tattersall’s mesmerising lead guitar has become more prominent while an affinity with good old fashioned rock ‘n’ roll has become all the more apparent with last year’s surrealist garage-rock record, Great Big Flamingo Burning Moon. First up, it’s time for something completely different. Laura Kidd aka She Makes War tells the Brudenell crowd early on that she’s driven up from Bristol to be here tonight, if that isn’t commitment to the cause then I don’t know what is. Kidd has an undeniable presence on stage from the outset as she dives into an eclectic, dark and powerful set of songs. There’s a confessional element to the likes of ‘In Cold Blood’ while the accompanying guitar parts carry a hefty, grunge-like punch. The songs remain raw and emotionally exposed throughout with ‘Stargazing’ proving to be a melodic yet pleasingly unvarnished exorcism as Kidd repeats, “you’re less than a friend, less than a friend”. The highlight arguably comes with ‘Delete’, as Kidd creates a sea of voices using a loop-pedal before grabbing a megaphone and heading out into the Brudenell crowd. It’s an impressive performance and proof, if any were needed, that it’s always worth getting down in time to see the support act. Opening with the joyous frivolity of ‘Great Big Flamingo Burning Moon’ seems like the bands way of letting us know that The Wave Pictures are here to have a good time. What follows is a smorgasbord of lovely lo-fi, blistering blues and raucous rock ‘n’ roll all wrapped up in songs about panama hats, pool halls and the rain in Newcastle. And that’s just the songs from their latest LP, Bamboo Diner in the Rain. The songs are littered with fantastically free-wheeling solos from Tattersall, mixing rhythm and blues with some distinctly explosive fret-work. Songs from the new album sound reassuring confident with the likes of ‘Panama Hat’ combining the bands newfound blues-rock swagger with typically untypical lyrics concerning cats and Peach Schnapps. It also manages to sound like some of the most thrillingly direct rock ‘n’ roll I’ve heard in some time. 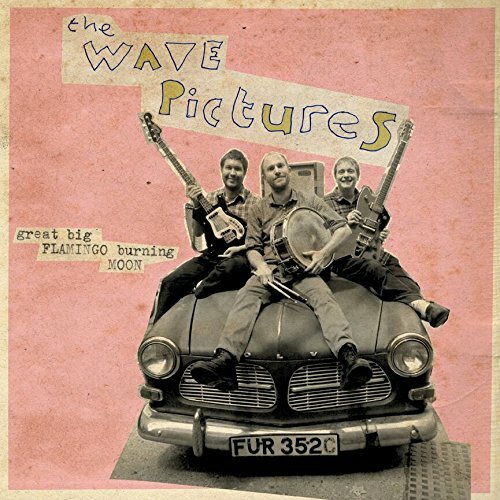 The Wave Pictures are clearly in love with rock ‘n’ roll music and its inherent ridiculousness; delivering guitar wizardry, a drum solo and, in the form of ‘The Running Man’ a genuine classic-rock riff. Of course, everything is filtered through the bands lo-fi indie roots. Far too grounded to be anything as predictable as rock-stars, they’re a band that knows not to take any of it too seriously. It’s that sense of fun and free-spiritedness that makes this Wymeswold three-piece such an exciting live prospect. It’s easy to forget that the band has been around for some time now and they’ve created a pretty impressive back-catalogue. We getting a rollicking rendition of ‘The Woods’, classic single ‘Just Like a Drummer’ and a genuinely touching ‘A Letter From Hull’ that finds Tattersall singing “I know you, your sense of humour will get you through”. My personal highlight comes when Helm takes lead vocal duties on a vintage Wave Pictures track, ‘Without Feathers’ and puts in an absolutely stunning vocal performance that simply demands your full and undivided attention. Morrissey eat your heart out. As if all this wasn’t wonderful enough they encore with a thoroughly unexpected (but welcome) cover of The Rolling Stones ‘Let it Bleed’. For my money you’re better off going to see The Wave Pictures in the cosy confines of The Brudenell Social Club then the Stones at some huge stadium. Successfully reclaiming rock ‘n’ roll for the rest of us since 1998, long may The Wave Pictures continue.